Proverbs - a book full of wisdom - and yet a book demanding all one's wisdom to understand. ^^Derek Kidner not only has provided a running commentary on the whole of Proverbs but has also included two helpful study aids. The first is a set of subject guides that pull together teaching scattered throughout the book. The second is a short concordance that helps locate lost sayings (in territory notoriously hard to search) and encourages further subject studies. ^^In short, this volume is a wise person's guide to wisdom. .^^These commentaries are designed to help the reader of the Bible understand what the text says and what it means. The Introduction to each book gives a concise but thorough treatment of its authorship, date, original setting and purpose. Following a Structural Analysis, the Commentary takes the book section by section, drawing out its main themes, and also comments on individual verses and problems of interpretation. Additional Notes provide fuller discussion of particular difficulties. The goal throughout is to explain the true meaning of the Bible and make its message plain. About "Proverbs (Re-Formatted) (Tyndale Old Testament Commentary Re-issued/revised Series)"
Derek Kidner (1913-2008) was warden of Tyndale House, Cambridge. He wrote several volumes in the Tyndale Old Testament Commentary series, including those on Genesis, Ezra and Nehemiah, Psalms, and Proverbs. Kidner's works are full of the marks of both professor and pastor with his even-handed scholarship as well as his devotional insight. These qualities have made his commentaries in the Tyndale Old Testament Commentary series and The Bible Speaks Today series some of the most beloved and popular of recent decades. Kidner had a long career in both the church and the academy in England. He studied at Cambridge University and then served in the ministry for several years before becoming a senior tutor at Oak Hill Theological College. Kidner began his writing career while serving as warden of Tyndale House in Cambridge from 1964 to 1978, publishing his ninth and final book, The Message of Jeremiah, in 1987. 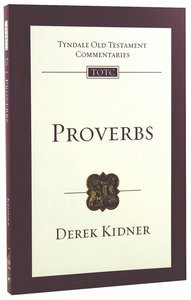 Customer Reviews For "Proverbs (Re-Formatted) (Tyndale Old Testament Commentary Re-issued/revised Series)"
Kidner's commentary on Proverbs is a helpful introduction to this difficult book. The commentary has a short introduction to the various issues surrounding Proverbs; then a helpful 'subject-study' section that includes 8 themes. For example, God-man. The commentary then proceeds to a verse-by-verse engagement with the text and finally ends with a helpful short concordance of Proverbs. However, the commentary could be improved in the following ways: it's age (1964), its length, which allows for only the briefest of comments (192 pages). Compare this to the FOTB entry on Proverbs, pitched roughly to the same audience, with 432 pages. Finally, a more comprehensive concordance or index would also be beneficial. Having said that, it is a useful introduction to the Book of Proverbs.